Everything you need to know about our so-called “Fiscal Cliff” and the janitors in Cincinnati who are truly living on the edge. “I really want people to understand that we all work just as hard as the next person that’s in a business suit,” says Tamika Maxwell, mother of three, describing her work as a janitor in Cincinnati, her hometown. Along with 1,000 colleagues in the city, Maxwell hopes that current negotiations between SEIU and the city’s cleaning contractors will raise their $9.80 hourly wage—which, for annual full-time work, still leaves a family of three below the federal poverty line and relying on food stamps and Medicaid. In essence, the state ends up subsidizing corporations to continue paying people a non-living wage. Maxwell works part-time while also pursuing a business degree at Cincinnati State. She’s now employed by Scioto Services, which recently won the contract for the Public Defender’s office building that she has cleaned for four years. The company retained Maxwell but cut back all of the janitors’ hours. Instead of working the 5–10 pm shift five days per week, Maxwell now works only four. “That’s a big deal when you’re only making $9.80 an hour,” she says. But perhaps what is most frustrating to Maxwell and her colleagues is that among the cleaning contractors’ clients are some of the richest companies in the world. Macy’s, for example, made $1.25 billion in profits last year; Fifth Third Bancorp took in $1.3 billion; and Kroger netted more than $600 million. In all, thirteen Fortune 1000 companies with their corporate headquarters in Cincinnati earned combined profits of nearly $17 billion in 2011. If any of them told the cleaning contractors to pay a living wage, the contractors would do so, and would pass the additional cost onto the multibillion-dollar corporations. Indeed, Procter & Gamble instructed its cleaning contractor, Compass, that the janitors who clean its headquarters should earn a living wage. Compass then offered the workers healthcare and guaranteed full-time hours, as well as an hourly wage increase of $0.30 in the first year, $0.25 in the second year, and $0.30 in the third year. That would result in a $10.65 hourly wage in 2015, and an average annual salary of $19,863 (just over the poverty line for a family of three). In contrast, the other contractors involved in negotiations with SEIU are offering next to nothing: a wage freeze for two years and a ten-cent increase in 2015. 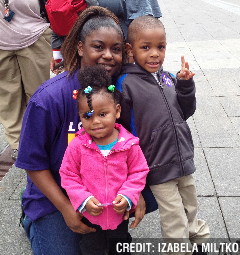 Maxwell takes her son to school every morning at 7:45, then gets on a bus to go to school herself. After classes, she is home to help her son with homework, and then takes the kids to day care at 4:30—in time to arrive at work at 5 pm for her five-hour shift. Maxwell believes that part of the reason for the plight of the janitors is that “people really don’t understand the work that we do.” In her shift, she cleans forty-three bathrooms on thirteen floors. Half of the bathrooms have two stalls, half of them are singles. That’s about sixty-five toilets a night, or thirteen an hour—about four and a half minutes per toilet. That’s hard enough to do in five hours, and of course the job involves a lot more than cleaning toilets. With so much stress over their reduced hours, one way Maxwell and her colleagues try to make up their lost income is by working overtime to fill-in for someone who can’t make it to work. But she says collecting the extra pay can be a challenge. “I worked two extra hours over four weeks ago and still haven’t gotten paid,” she says. She has also been waiting for three months for Scioto to fill out a job verification form that she needs so that her family will not be cut off of food stamps. “Every time I see the manager and ask him about it he says he’ll get it back to me or the office hasn’t sent it back yet—gives me the runaround,” says Maxwell. It is our human resource investment, however; [sic] that makes us most proud. Scioto Services associates are encouraged to become volunteers with community organizations including the local Chambers of Commerce, Project Parks, Big Brothers/Big Sisters, YMCA, Meals on Wheels, youth sports programs, regional food banks, adult literacy programs and youth tutoring, just to name a few. At Scioto Services, we’re convinced that community involvement is the best way to show our pride in who we are, what we do, and in the communities where we do business. Another way to invest in human resources and the community is by paying workers enough so that they can eat. In the meantime, Maxwell hopes that people will rethink their assumptions about janitors and their labor, and get involved in the fight for better pay. You can e-mail building owners in Cincinnati—companies like Macy’s and Fifth Third Bancorp—and ask them to support good jobs for janitors here. I’ll be trying to reach them and the cleaning contractors—and continue talking to the janitors—to keep you updated on this story. Our So-Called Fiscal Cliff: What the hell is it and what can you do? I hate webinars—loathe them, actually, even though I understand they are a necessary evil nowadays. So what the hell is our so-called Fiscal Cliff anyway? There are four major pieces of policy happenings between the end of December and early next year: the Bush tax cuts, along with the temporary expansion of unemployment insurance, expire in December; the sequestration—which means automatic, across the board cuts of about $110 billion that are scheduled to occur in January; the debt limit has to be raised in early 2013 so the government can borrow money to finance current operations; and then the current fiscal year appropriations are only funded through March 27 and need to be completed. “What’s really driving the near panic in Congress is the combination of the tax cuts expiring and the sequester taking effect,” said Nissenbaum. But she said that the panic is unjustified—it really wouldn’t be the “cataclysmic event” it’s being made out to be. “Nothing happens automatically on January 2—the cuts start to phase in, the tax cuts start to be eliminated,” she said. If the choice is between a bad deal [at the end of the year]—a deal that relies heavily on spending cuts, that doesn’t protect the poor—or no deal, that’s simply not a tough choice.… The single most important principle that should guide all of the decisions around deficit reduction is that [it] should not increase poverty or inequality. These are the three areas in play for any deficit reduction agreement: (1) discretionary spending (appropriations), (2) health/other entitlements and (3) revenues. The Budget Control Act of 2011 and other cuts last year already axed $1.5 trillion from discretionary spending, but there was zilch in new revenues. “We have already cut non-defense discretionary down to the bone—particularly from historical levels,” said Nissenbaum. Therefore, Nissenbaum said, a major concern is whether the president and others will “wall off” the non-defense discretionary programs that protect the poor—such as education, job training, WIC, Head Start, childcare—and prohibit further cuts. With regard to revenues, Weinstein said that “changes in the tax code need to seek revenues from those who can afford to pay, and protect those people who can’t afford to pay more.” The refundable Earned Income Tax Credit and Child Tax Credit—which together lifted 8.7 million people out of poverty in 2011—are two of our most effective antipoverty tools and have enjoyed longtime bipartisan support, but will be targeted for cuts by conservatives. Nissenbaum warned that while conservatives have signaled that they might agree to a small amount of revenues for deficit reduction, “what they really want is to essentially give us a nickel in taxes, only in exchange for requiring the tax committees in Congress to make another round of massive tax cuts on income tax rates well below the Bush levels.” She said some bipartisan proposals are touting a top rate of 26 to 29 percent. “You can imagine how that would decimate the parts of the budget we all care about if revenues dropped down that low,” she said. With regard to entitlements, Nissenbaum thinks the three that are most in jeopardy are Medicaid (and whether costs will be shifted to the states); cuts or structural changes that limit the reach and effectiveness of SNAP (food stamps); and Supplemental Social Security Income. She believes Social Security “by and large” will be off the table. But with a goal of $2 trillion in deficit reduction (beyond the $1.5 trillion in cuts already made under the Budget Control Act)—and so many parts of the budget being entirely or largely protected in Congress, Nissenbaum believes discretionary domestic programs and low-income entitlements will take the biggest hits if major revenues aren’t part of the deal. Weinstein encouraged people to participate in the SAVE For All campaign, which now has the participation of over 1,900 organizations and many individuals nationwide. It’s pushing for a deficit reduction agreement that protects low-income and vulnerable people, promotes job creation, increases revenues from fair sources and seeks responsible savings from the Pentagon and other areas. You can send an e-mail to your senators and representative; meet with a staff member in person, or connect with them through statewide conference calls that CHN is helping to organize (contact them). Groups and individuals can write op-eds, letters to the editor or arrange meetings with editorial boards—CHN can assist with this as well, as can the Children’s Leadership Council. Groups can hold an event at a service provider’s site, or demonstrate in front of a senator or congressman’s office—Nuns on the Bus style. Finally, stay tuned for a National Call in Day on November 28. The bottom line is this: if you care about poverty and not making things harder for people who already have it tough, speak out during this debate. You can bet people who don’t share your interests will, and a lot of them will have much deeper pockets than you do. Be heard, be visible. End Child Hunger: The New York City Coalition Against Hunger (NYCCAH) is calling on President Obama to publicly re-commit his pledge to end child hunger in America. You can sign an online petition here. To learn more about why ending child hunger is not only the right thing to do morally, but also good for the economy, read NYCCAH executive director Joel Berg’s letter to the president. National Hunger and Homelessness Awareness Week (NHHAW), November 10–18: On the eve of the halfway mark for The Journey Home—Baltimore’s ten-year plan to end homelessness—students from colleges and universities in and around the city are organizing a series of local events to mark NHHAW. The events will culminate with: “A Bench is Not a Bed: Sleepout” tomorrow, November 17, beginning at 6 pm at the War Memorial Plaza in front of City Hall (100 North Holliday Street). For additional information contact NHHAW.Baltimore@gmail.com. Urge Congress to Support Affordable Housing: In 2008, the National Housing Trust Fund (NHTF) was enacted as part of the Housing and Economic Recovery Act of 2008. Its purpose is to create dedicated sources of funding to build, preserve and rehabilitate housing for low-income people. Unfortunately Congress has never approved funding for the NHTF. With over 630,000 Americans homeless, Fighting Poverty with Faith is calling on Congress to fund the NHTF at $1 billion, providing quality and affordable homes to 3.5 million extremely low-income households over the next ten years. You can contact your senators and representative and urge them to approve $1 billion in funding here. “Married… Without Means,” Shawn Fremstad, Center for Economic and Policy Research. Policy makers and too many in the “liberal” media often claim that marriage is a way out of poverty for Americans striving for the middle class. Fremstad’s excellent new report demonstrates that most parents with below-poverty incomes who are raising children are, in fact, married. He attributes the struggles of married adults to policy decisions that have led to stagnating wages; the lack of a coordinated child care and early education system; and a failure to institute basic labor standards such as paid family leave. “Pulling Apart: A State-by-State Analysis of Income Trends,” Elizabeth McNichol, Douglas Hall, David Cooper, and Vincent Palacios, Center on Budget and Policy Priorities and Economic Policy Institute. The gaps between the incomes of the richest households and low- and middle-income households are wide and growing in most states. Between the late 1990s and mid-2000s, gaps between the richest and the poorest households widened in forty-five states and DC, and narrowed in none. Incomes fell by close to 6 percent among the bottom fifth of households, on average, while rising by 8.6 percent among the top fifth, during this period. Incomes grew even faster—14 percent— among the top 5 percent of households. For the middle fifth of households, incomes grew by just 1.2 percent. The study is one of the few to examine income inequality at the state level, and it finds that growth in wage inequality is the biggest factor contributing to the income gaps in most states. The report recommends state policies that can mitigate the widening divide, including: raising and indexing the minimum wage; making state tax systems less regressive—they currently rely more on sales taxes and user fees that hit low-income households especially hard, rather than progressive income taxes; strengthening supports for low-income workers such as childcare, transportation and health insurance; and strengthening the unemployment insurance system so that more unemployed workers are able to access benefits. “State Asset Limit Reforms and Implications for Federal Policy,” Aleta Sprague and Rachel Black, New America Foundation. Nearly every means-tested public assistance program employs an asset test, which is a limit on the amount of savings and other resources a family can own and remain eligible for benefits. Though asset tests vary widely across programs and states, the limits typically hover around just $2000, thus requiring families to remain in both income poverty and asset poverty to receive benefits. This report identifies some of the impacts of both implementing and reforming asset limits on the administration of the SNAP (food stamps) and TANF (cash assistance) programs. Key findings include: assets limits pose a barrier to long-term self-sufficiency; and a variety of resource and political barriers must be overcome to lift asset tests. “Young Children at Risk,” Taylor Robbins, Shannon Stagman, Sheila Smith, National Center for Children in Poverty. Across the United States, large numbers of young children are affected by one or more risk factors that have been linked to academic failure and poor health. Chief among them is family economic hardship. Additional risk factors can markedly increase children’s chances of adverse outcomes, too. The national and state data presented here highlight groups of vulnerable children and families whose needs can be addressed through a wide range of family support, health and education policies. Information about the size and characteristics of a state’s population of young, at-risk children can inform policy decisions about investments in new or expanded supports that help mitigate risks and improve life outcomes for these children. “Weathering the Great Recession,” Economic Mobility Project, Pew Center on the States. The report reveals that while all communities felt a devastating impact on their economic security, high-poverty neighborhoods lost the greatest percentage of wealth. Families in low-poverty neighborhoods experienced wealth losses of 47 percent, while those in high poverty lost an astounding 91 percent. Other economic measures examined in the report include: homeownership and housing equity losses; mortgage payment distress; wage decreases; and unemployment. “The Volunteer Experience: Men and Women Who Make Free Tax Preparation Work,” National Community Tax Coalition (NCTC). NCTC works to create a more accessible and equitable tax system for American workers. It represents more than 63,000 volunteers at 6,300 community Volunteer Income Tax Assistance (VITA) sites. Last year, these volunteers prepared an estimated 1.6 million federal tax returns for low- and moderate-income workers. The program depends on volunteers willing to spend long hours performing a sometimes very tedious task. What makes them do it? NCTC interviewed four volunteers to learn more about their motivations, experiences and backgrounds. Children under age 6 below twice the poverty level: nearly half, 11.4 million children. States with child poverty rates of 20 percent or higher: 27. States with child poverty rates of less than 15 percent: 7.